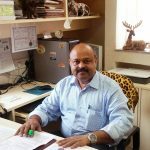 Dr. Ajay Gaur is a Principal Scientist and Project Leader at Laboratory for the Conservation of Endangered Species (LaCONES), an annex of Centre for Cellular and Molecular Biology, Hyderabad, India. He is a doctorate in Genetics from Haryana Agricultural University, Hisar. His areas of research interest are Conservation Genetics and Molecular Ecology of endangered species especially, Indian big cats, ungulates and reptiles. His group work towards the development and application of molecular markers in population and evolutionary genetics and in wildlife forensics. He is heading the Wildlife Forensics Facility at LaCONES and also involved in the Conservation Breeding program of Central Zoo Authority of India. He has published several research articles focusing on conservation genetics of Indian endangered species. He is a member of IUCN-SSC Asian Wild Cattle Specialist Group, American Genetic Association (AGA), Society for Conservation Biology (SCB) and Association for the Promotion of DNA Fingerprinting and other DNA Technologies (ADNAT).